Abdullah Alawayed, the Damascus Chef, has started a regular pop-up at Archibald's in Catford, SE6 showcasing Syrian cuisine. Serving from 6pm - 10pm, you can book 3 courses for £27, or eat a la carte. Expect something like sautéed tuna on a muhammara base - Sounds great! 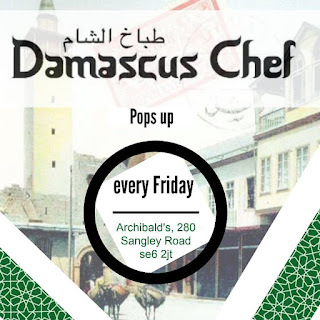 "Drawing on the many threads of Syrian cuisine, Abdullah Alawayed, the Damascus chef, stimulates the senses of vegans and carnivores alike, the gluten lovers and gluten free, the light snackers and the heavy eaters among us with zest, passion and precision."